MaxaBiotic is a feed supplement containing natural prebiotic and probiotic ingredients, plus Green Lipped Mussel for horses, to help maintain a healthy, balanced digestive system. Yeast is added to encourage the growth of friendly bacteria, with dietary fibre and Alfalfa to help maintain regular gut function. The addition of Green Lipped Mussel is designed to help ease irritation and promote intestinal health. Green Lipped Mussel is known for its high levels of Omega-3 ETA fatty acids which have natural soothing properties. 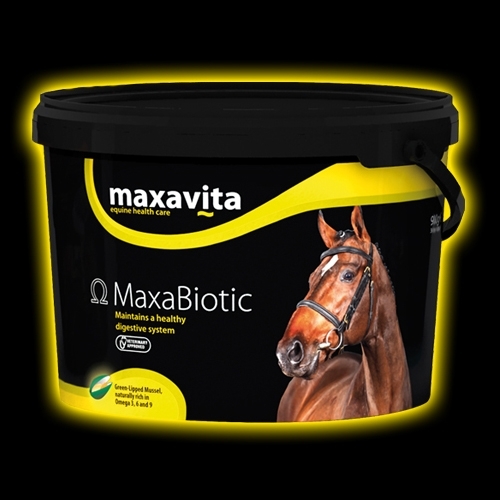 MaxaBiotic is suitable for feeding in times of stress and as a daily supplement for horses with digestive problems. MaxaBiotic contains no listed banned substances. 1 level scoop (30g) daily with feed. A probiotic strain of yeast which helps to support the digestive tract and maintain healthy gut function. A prebiotic complex carbohydrate which encourages the growth of ‘good bacteria’ to support digestion. FOS is also a good source of dietary fibre further promoting intestinal health. Our unique Green Lipped Mussel extract contains high levels of Omega-3 ETA fatty acids, which have natural soothing properties to help ease irritation. My top horse Malin Head Clover is fed on Maxabiotic. He is a horse that tends to have a sensitive digestive system and since he has been on the biotic he has showed no signs of loose waste or uncomfort.